Bronze plaque mounted on a wooden backboard. Dedicatory inscription is cast in relief at the top with a wreath and cross positioned top left. The names are in four columns below this. 2011, November: plaque reinstalled in church. The Chapel no longer exists due to redevelopment of church. 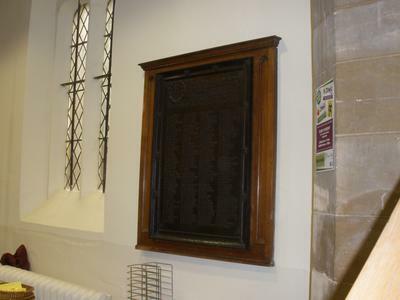 2011: plaque moved to storage during building works.